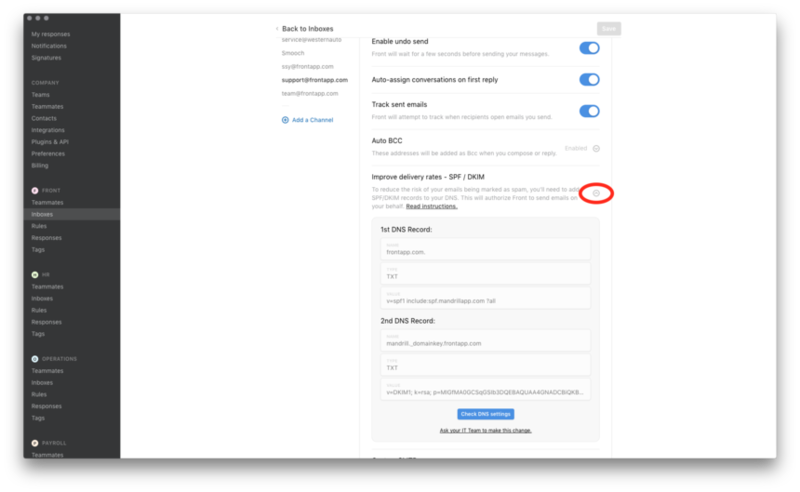 If you are using SMTP channels in Front, we strongly recommend that you authorize SendGrid to send emails on your behalf by setting up specific SendGrid SPF/DKIM entries in your DNS configuration. 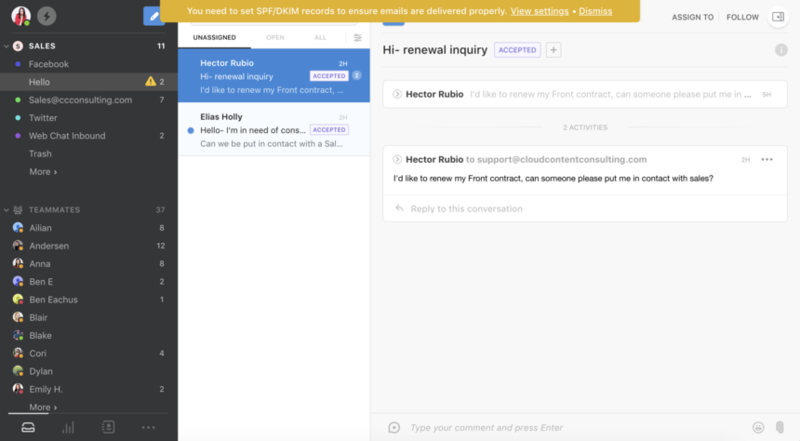 This will improve email deliverability, avoid messages being marked as spam, and remove the "via sendgrid.net" that appears next to the sender email address in your sent emails. You will see a list of your SMTP channel domains under Domains on the left. 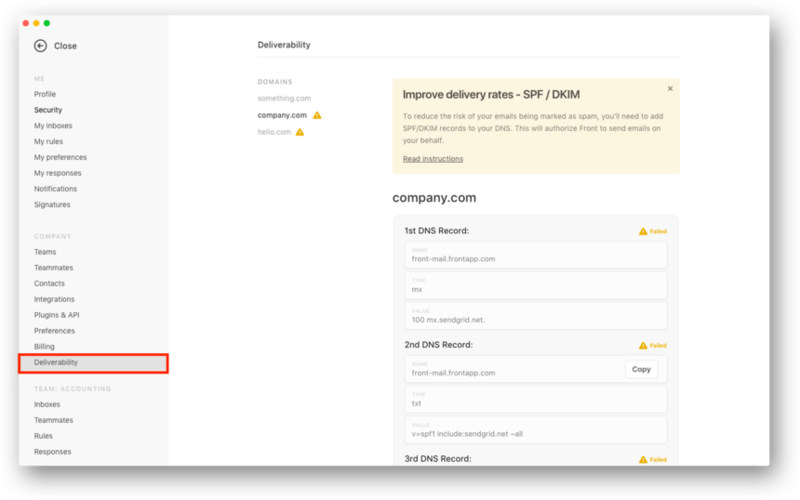 Any email domains you're using with missing SPF/DKIM records will have a yellow warning icon. 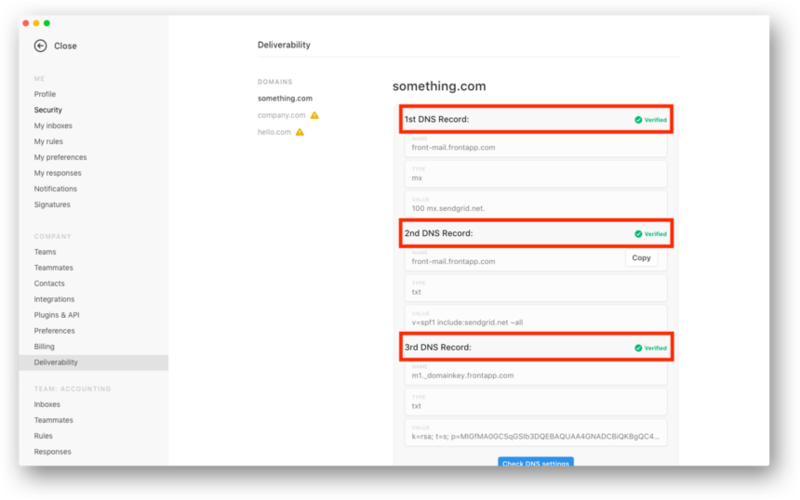 Take the values and add them as a DNS record in your DNS settings. Each provider offers a different UI to add these entries to the DNS. Please ask your IT department if you're unsure how to do this. Once your DNS settings are set, you can come back to Front and click Check DNS settings. This will trigger a check by SendGrid to verify that your DNS configuration is correct. Be aware that SendGrid might not see your changes before the time specified in your DNS TTL settings. Wait a few seconds and the validation result will appear (with the encountered errors if any). Each provider offers a different UI to add these entries to the DNS. Feel free to ask your IT department if you're unsure about this. Once your DNS settings are set, you can come back to Front and click Check DNS settings. This will trigger a check by SendGrid to verify that your DNS configuration is correct. 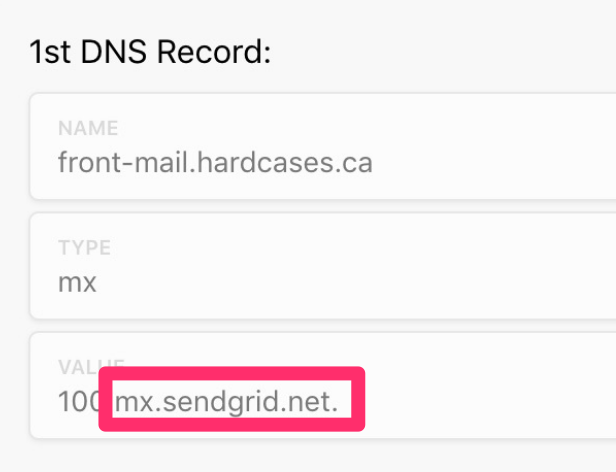 Be aware that SendGrid might not see your changes before the time specified in your DNS TTL settings. You're missing a step between #3 and #4 – how to add these entries to our DNS. tyler martin This is different for a lot of people, depending on the provider. Bobby Shiffler I'm sorry we can't be of more help! Due to the many different providers, even we don't know how to do this for every single one. We suggest contacting your specific provider for assistance on their platform. we use network solutions. i don't see a way to add the values shown on the 1st, 2nd and 3rd DNS records into network solutions. front mentions that 2 records are TXT and 1 is MX but it doesn't indicate what is the Host / TTL and TEXT value we should input on the DNS administrator, in network solutions. can you please help? Ricardo G. Hi! Can you please provide your company name so I can look into your account? If you prefer to email me, that's fine as well. Just sayin... I finished 3 other trials with different companies before choosing Front and they have instructions that go into more detail or at least a link to the 'how to' page for each of the providers. The instructions are not clear at all. I've done cname changes and other things like that and have been able to figure it out. After, it required another call to figure out what the original settings were and to re-enable my ability to send email until I was ready. I was still on a trial with Front and not ready to use only the Front inbox. Emails were still being sent to my Gmail through pop3. The poor explanation of these settings lead me to set this up (to ensure deliverability) without realizing the consequences of getting it wrong. I looked at the settings the Bluehost tech entered and there is honestly no way I would have figured it out on my own. I think these instructions could be 'rewritten for simple folk' that are using this software as an email management solution without assuming we all have an IT team to handle this. At least with a warning not to make any changes unless you are 100% certain what you are doing. Amy Whitney Thanks for the feedback. We will definitely add a warning. I got these instructions in my email late last night and now I have the team that is using front freaking out because they are getting the warning. Getting these instructions last min is pretty disheartening. Also I cannot make the changes to the MX records in the fashion that your suggest here using HostGator. I need support but cannot find a way to get personal support for our specific issue. Very frustrating all around! Joe Motz We received your email as well and will follow up there. I have two out of three working. But then I come back to Front and it tells me all three are not working again. This is very confusing, you should definitely have a lot more support for your users. How would I change this if my email is set up with Google? Right now your instructions don't seem to work. 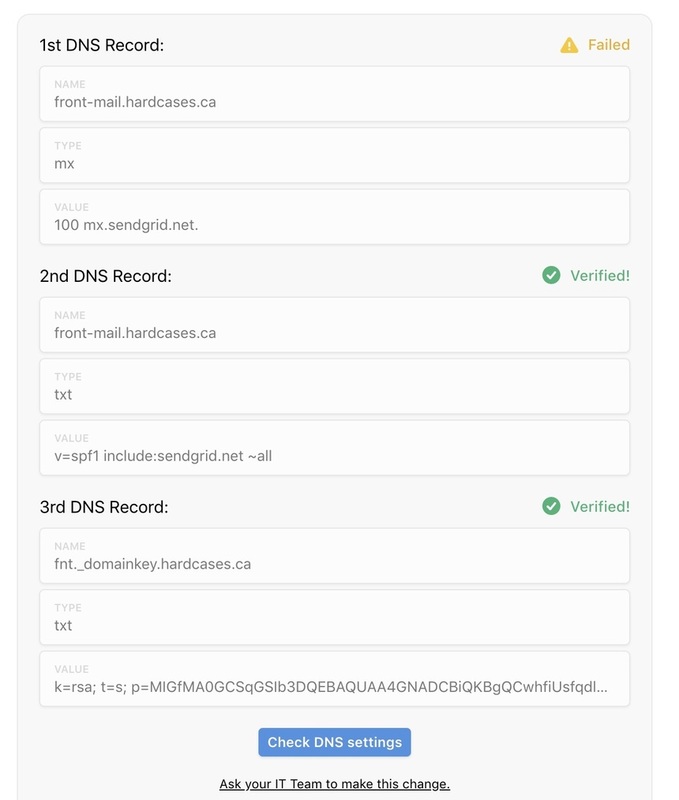 David Couillard I seem to have the same issue - 2 of 3 DNS records show they are verified. The mx value on the first DNS is still marked as "failed" even though we have adjusted the values on our host. Have you got the same problem? Can you post the correct cpanel settings? Kevin Garcia Exactly! When I click Check DNS Settings tow of them work but the MX doesn't. Then if I leave the page and return, all three are marked as Failed again. I don't think there is a way to do this in Cpanel without calling...I'd like to echo David's request to post directions for Cpanel users - this is very common and I imagine many people are on this platform. For those having problem with the MX, try adding the code without the 100 in front. The 100 is the Priority and NOT part of the Value. It's confusing because I started by copying the entire line and my DNS change was being refused. So in my case, I would only add mx.sendgrid.net . We are forwarding from Google Apps and letting it be our SPAM filter. Can we dismiss the warning some way? 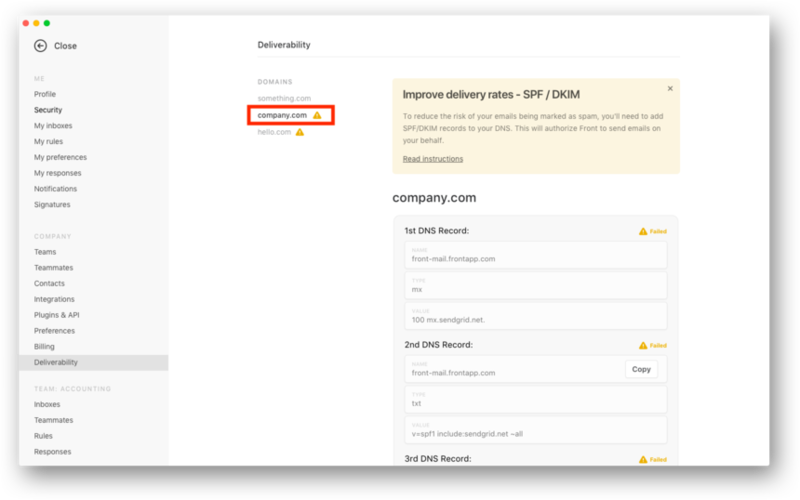 I do not see DELIVERABILITY under my company settings. I am currently working with gmail syncing to Front. Is there something I need to do? curtis Hi there! Can you send us an email so we can investigate your account?